This is the web site of the company that has been making our saddles. 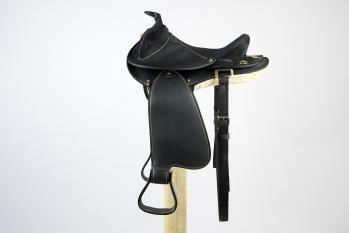 They are custom made and they will help you get the correct saddle. All their saddles are custom and hand-made in the United States of the best American Cowhide they can find. The leather they use is strong, heavy and flexible. You will not see any two saddles exactly alike, as each is an original crafted by their saddlemakers to your requirements. Check out the condura/leather saddles if you want a lighter weight saddle when lifting a heavy saddle up on the back of a 17-18 hand horse is difficult for you. Their saddles come in four colors, lite oil, Medium brown, black and Mahogany. We carry have matching bridles, breastcollars, cinches and back cinches. This saddle combines the swinging fenders, genuine sheepskin panels, and saddle skirts from Western saddles with the suspended seat and poleys of Australian saddles.